You’ve laid the groundwork. As young as elementary school you’ve likely asked your child, what do you want to be when you grow up? You may have had conversations about what your family values are, or your kid picked up these principles over the years. Now you have a young adult, who may be on a path to finding their purpose in life, or they may feel completely lost and unsure of what to do. Finding purpose can be a lifelong endeavor—something you may still be working through yourself! In The Path to Purpose: How Young People Find Their Calling in Life, William Damon, director of the Stanford Center on Adolescence, defines purpose as “a stable and generalized intention to accomplish something that is at the same time meaningful to the self and consequential for the world beyond the self.” Based on the Center’s research, Heather Malin, director of research, says the key time for purpose is the 18 – 23 age range. Here’s how you can play a supportive role in helping your kid find their purpose at this time. Young adults are in a time of their life when many questions, ideas, and insecurities can emerge. It is at this time when you can help them think about the meaning of what they do and what they are interested in. “An emerging adult who takes the time to deeply reflect and raise their own self-awareness about their innermost desires can be guided by them if they have at least some clues from listening to who they are and what they value,” education consultant Jennifer Miller says. Simply asking “what is your purpose?” or “what is your passion?” may not be the best entry point for helping young adults find a meaningful path in life that is both fulfilling and sustainable. Jane Horrowitz, a career coach for young adults, says she has found that it’s unrealistic to expect young people to know what their passion is. “They don’t have enough experience yet to really figure it out,” Horrowitz says. “The idea of finding their passion puts too much pressure on them.” Instead, start a dialogue that gets your young adult thinking about why exactly they like what they like, what their strengths and values are, and how those fit in with possible careers and life goals. Questions about their contribution to the world help get them thinking about direction. “Jobs come and go but asking how you want to make a difference offers a trajectory,” Miller says. Jennifer Tanner, developmental psychologist and co-founder of the Society for the Study of Emerging Adulthood, emphasizes that there a million ways to make a living, but asks, so what? “The missing piece is purpose,” Tanner says. “How are you going to contribute yourself - your gifts, your passions, your interests - to the world? We need every emerging adults' energies focused on what their contribution is going to be. It is absolutely critical for an emerging adults' sense of well-being. This feeds their intrinsic motivational needs for autonomy, belonging, and competence. And it engages the young adult as a citizen who can become a capable contributor.” Encourage them to think about their various experiences and how they may have made a difference. Then ask, how do you want to contribute to the world? Who do you care about impacting? “Kids who have the most purpose are the ones who lead with their values,” Malin says. Horrowitz says she shows the graph above to young adults she works with to help them visualize how their strengths, values, work, and impact on the world intersect as their purpose in life. Young people are said to be more hopeful and optimistic than their older counterparts. With little experience in the “real world,” they are often full of dreams and aspirations for their life. You may admire their optimism and hope, but want to give them a reality check by pointing out that actually making money is necessary to live and survive. In the national Clark University Poll of Emerging Adults, 79% of 18-29-year-olds agreed that “it is more important to enjoy my job than to make a lot of money.” While you certainly want your kid to enjoy their job and find their purpose, the balance between joy and reality can be challenging to navigate. Breaking down goals into both the short and long-term can help your young adult figure out how their actions are impacting their future aspirations. Plus, it’s a great way to reflect on purpose. 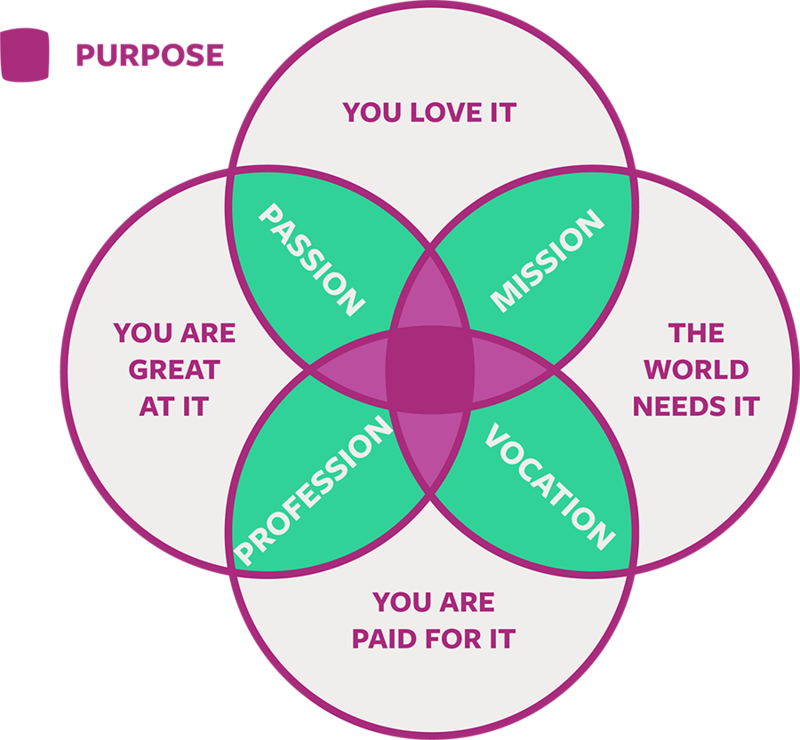 “[Purpose is] what matters to you and how that looks in your life right now, and what does that look like in the future,” Malin says. It can be hard to think in the long term when you are unsure where to start. Perhaps, start by talking about your short and long-term goals at this time and how your career path took form. “Parents can share stories of their own discoveries of meaning and purpose,” Miller says. Jackson suggests discussing how a job in one area may lead to their ultimate long-term goal or aspiration. Miller says young people should just get started at whatever level possible in their desired industry. “We know that a career emerges from relationships,” Miller says. There are many ways for your young adult to get to their desired goal—all the different paths may surprise them! Talk about expectations versus realities. Some young adults may find that they differ quite a bit. If they are graduating from college and can’t seem to find a job, they may get quite a jolt of reality. Or, they may land their first job and feel discouraged that it is not something they really care about. Careers take time to build. Talk with them about the steps required to get to certain levels in any field. Tell them that they will have to do tasks and jobs that they may not want to do in order to gain experience and knowledge. Ask where purpose can come from in their life outside of the job they are currently doing. The key is self-reflection every step of the way and thinking about these steps as part of a bigger picture. As a parent, asking probing questions to your kid is part of your vocabulary. I can see that X is really important to you. What do you like about it? What are you doing when you do X? How do you see these interests and skills intersecting with a career? How do you want to contribute to the world? In what area do you want to make a difference? Who do you care about impacting? Who does a really great job at what they do in something you’re interested in? What do you think they did to get to that point and excel at it? How is what they do meaningful to them? What is most important—making a lot of money, loving what you’re doing, or having a lot of time to spend with your family? How does where you come from impact where you want to go in the future? What experiences in your life led you to your decisions to pursue certain subjects or career interests? What are your long-term and short-term career goals? What kind of expectations do you have for getting a job? What is required in you getting there? How quickly do you see yourself arriving at fulfilling job? I’m noticing a lot of X in the news lately. How do you think this might affect your future hopes and goals? What do you think I want for you and your future? What do you think are the most important questions you should be asking yourself right now? Everyone brings something unique to the world. Encourage your young adult to think about their own background and how this plays a role in their future. “We want young people to understand themselves better, build personal agency, learn how to build their voice, reflect and respond to feedback, and to have goals,” Jackson says. Self-reflection is a huge part of any path they may take. Malin says purpose and identity are linked. “Purpose can be an expression of your identity. It’s taking what is important to you and making a contribution to the world,” Malin says. “Or finding out your purpose in the world [helps to] inform your path that makes a difference in your identity.” Asking some of the above questions is a great way to help your young adult think about themselves in context of the broader world, and their role within it. Let’s face it, what you want for your kid may differ from what they want for themselves. Really listen to your young adult as they explore their purpose. “When you’re pregnant and you have the kids in the womb, you start building expectations for them before they can even open their eyes,” school counselor Dawn Mann says. “You forget to talk to the kids. You really need to listen to your kids. Your goals might not match.” As they grow into adults, it is time to step back and try to be supportive, even when you don’t completely love their choices. As a parent, you want your kid to be happy and successful, but how they get there may not match the ideas you have in your mind. Talk to your young adult about this and then really listen to what they have to say. You can’t find their purpose for them.